When the tooth destruction exceeds the limits (strength/durability) of composites we can use the world’s most advanced dental restoration system, Cerec 3™. It enables Advanced Dental Care to provide our patients with porcelain crowns, inlays, and onlays during a single office visit. No temporaries to worry about falling off in between visits. Cerec 3™ uses CAD/CAM technology that allows us to obtain 3-D-perspective imaging of the affected tooth. In our office, we can prepare, design, and precisely create the dental restoration to be bonded to your tooth that very day. 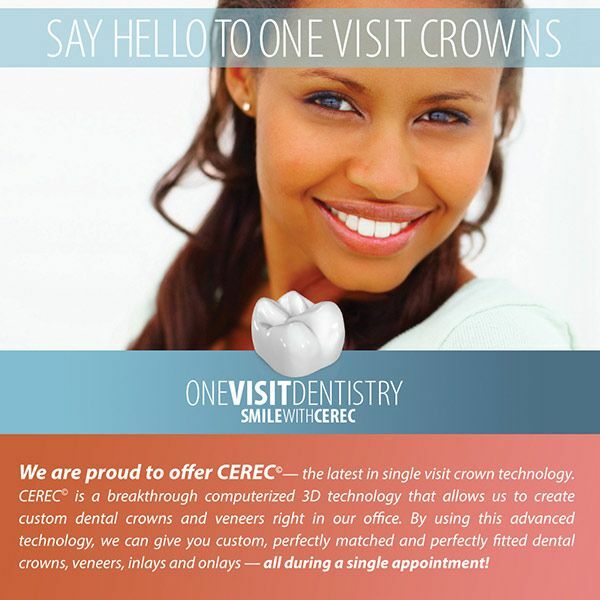 The ceramic material used with Cerec 3™ is strong, durable, and matches the natural color and anatomy of your teeth. Advanced Dental Care offers dental restoration, as well as many other services at our Providence, Rhode Island ( RI ) office. Request a consultation today by either filling out our request form, or by calling our office at (401) 273-6780.